Maris Polymers was honored at the annual meeting of business excellence “Diamonds of the Greek Economy 2015″ – The Healthiest Developing Enterprises in the Country “, held in the presence of political and especially the business world. 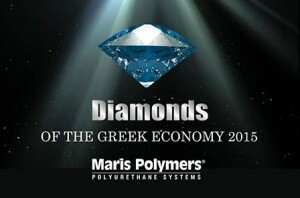 Maris Polymers earned this award and was selected among a large number of companies included in the final list of Diamonds of the Greek Economy. Maris Polymers is a company of international scope, active in the chemical field and following 25 years a dynamic extroversion strategy continues expanding in more than 75 countries.